Add this to the questions I'd love to ask a 1905 Santa Rosan: "What is a pet?" As a followup, I'd ask, "what do you consider to be animal cruelty?" There are few mentions of pets in the 1905 newspapers. No pets were sold through classifieds, no notices appealed for help finding missing animals, no merchants advertised sales on feed. Except for the little Newman's Drug Store ads for "Dent's Dog Remedies," you'd hardly know that anyone here had domestic pets at all. What we can glimpse about pets in that era comes from news stories; we learn that some city residents kept raccoons because one got loose the year before on Cherry Street and a frightened neighbor thought there was a burglar on the roof, and another escapee was shot out of a tree by a policeman. Like today, people were tender-hearted; witness the couple on Fourth Street who tried to nurse back to health a paralyzed chicken. Also like today, dogs were regarded with special affection. In all the reportage of the Battle of Sebastopol Avenue, the only true "human interest" story described Bum, a dog that became the mascot of the Petaluma & Santa Rosa Railway, catching rides back and forth as workers competed for his/her attention. But at the same time, dog poisoning was one of the most common crimes of the day. Or was it a crime in 1905? I recall no mention that police ever investigated, much less nabbed anyone for the killings. But 1905 attitudes towards cats were considerably less sympathetic, judging from the final item below. At first I thought it must be a hoax, given both the unspeakable cruelty and the jokey writing style; the unlikely name of the perpetrator seemed like another clue. "John June?" Sure enough, however, a man by that name is listed in the 1905 Cloverdale directory, employed in "restaurant and livery." Warning, cat-lovers: go read something else instead. Seriously. "Bum" is the mascot of the electric railroad men and he is well known all over the system between this city and Petaluma. Bum is a dog picked up by one of the train men and duly installed as the canine pet of the road. He travels first on one car then on another, passenger or freight, and does not care what is is as long it is a ride. There are [sic] some good natured rivalry among the men as to which can lay claim to being "Bum's" favorite, but so far doggie has evinced a rule to have all friends and no favorites. The men have taken up a subscription among themselves and have raised a fund sufficient to buy "Bum" a collar that will be one of the finest in dogdom. Director Frank Brush made "Bum's" acquaintance the other day and incidentally learned the bit of history connected with the electric's dog. Mr. and Mrs. S. Enders have a chicken at their home on Upper Fourth street which laid on its back, wedged between a fence and woodshed for an entire week, without food or water, and still lives. The night the chicken disappeared the family heard a noise and the barking of the dog, but could not locate the fowl. After a lapse of a week little Ralph Heim discovered the chicken laying with its feet pointed to heaven, and it was rescued. Special attention is being given the chicken at present, to nourish it back to full vigor and health. This is probably the longest instance on record of a fowl going without food and water and surviving. The animal's limbs are apparently paralyzed. Like the Geyserville dogs the Cloverdale cats are said to be mysteriously disappearing. The night warblings of backyard felines are becoming things of other eves and the bold mouse is pleasuring without fear. The Citrus City cats are being sacrificed in the cause of science. John June, the owner of a restaurant, a livery stable, a hotel and a teething baby, is said to have been catching the Cloverdale monsters, skinning them while alive for the purpose of securing and applying the electricity in the fur to the jaw of his sick infant. Several physicians in turn called to treat the child but it is said their directions were not followed by the man with the monthly name and more cats failed to return to their home kitchens at dawn. Finally Mrs. Prescott, representing the Humane Society, investigated the cat pelts lying around the June premises and swore out a warrant against the stable-keeping feline-electro scientist on the ground that he was committing a misdemeanor in not securing medical attendance for his sick child. June concluded to drop the study of electro science and skinning cats and sent for a physician to treat the infant. No matter how slow the news day, editors could always count on filling a few column inches with a report on the arrest, injury, or death of a local drunk. Often it was like sports reporting today, the incidents written up with flair and flourish intended to entertain the reader more than simply inform. Oh, the amusing tragedy of alcoholism. The first item below was written with so much elaboration that it may need a couple of reads to figure out the simple events that were reported. Following that is another story played for yuks, reporting that a man fell off a bridge, yet escaped serious harm. "Had the man not been impregnated with preservatives in the shape of booze, he might have been killed," the Republican paper noted. But weeks later, a smaller followup item revealed that he was actually paralyzed at the waist. The final piece was also written for laughs but happens to profile a remarkable hobbyist on Barham avenue who was operating a 1905 state-of-the-art distilling, brewing and wine-making operation out of his basement. Today Mr. R. Christ would be winning ribbons at the Harvest Fair, if not bottling something with his name on the label. A young Sebastopolitan named Pitts Tuesday night made himself intoxicated and then made "rough house" of the streets of his ordinarily quiet and peaceful hamlet. He tried to capsize several brick blocks and sought to drive his horse through the windows instead of the doors and attempted to mount to the roof to come down the chimneys, a la Santa Claus, and acted in every instance in a highly improper and indecorous manner. When Mr. Pitts found that a brace of big avengers in the persons of Officers Hankel and Boyes were camping on his lurid trail he turned on more speed and broke for home. His time was slow, however, and he was dragged off the track before the quarter pole was reached. In the City Prison during the remainder of the night the visitor from Gold Ridge had ample opportunity to muse over the peculiar chemical effects of beer looked upon when it is brown within the schooner. H.H. Allard, suffering from an acute attack of alcoholism, plunged backwards from the rail of the Davis street bridge this morning, in the bed of Santa Rosa Creek below. The bed of the creek was not so soft as the one in his native heath in Vermont, and his plunge resulted in a badly sprained back and severe contusions about the head and body. Allard had partaken freely of intoxicants and then seated himself on the rail of the bridge to watch the day grow older, and reflect on the abuses of liquors. 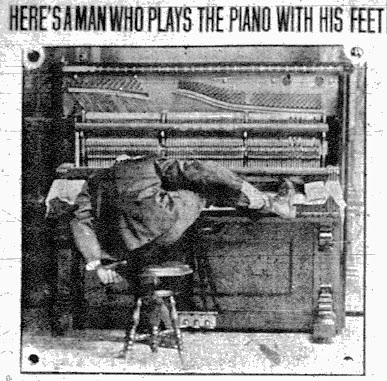 While thus engaged he suddenly lost his balance and went over backward. The fall was more than thirty feet, and had the man not been impregnated with preservatives in the shape of booze, he might have been killed. The ambulance was hurriedly called, and Allard was taken to the County Hospital. County Physician Bogle made an examination here and found no broken bones had been sustained. Allard has been in California about four months. He will be laid up for repairs for a number of days. With his head wedged between bales of hay, his pipe which he had been smoking still in his hand, Emil Heinson was found Wednesday dead in a barn on the C. Brown farm near Lakeville. Death from suffocation had taken place, probably some hours before his body was discovered. The man was a local character of Petaluma and vicinity known around the saloons which he frequented most of his time by the name of "Spike." Owing to his appetite for intoxicants his wife procured a divorce some time ago and is living in Petaluma supporting herself and little children by her own effort. In fact, he was in the County Jail on some drunken charge when the suit papers were served on him. From his drinking habits he had become partially paralyzed and because of this disability and his intemperate habits he was unable to do much work, consequently he drifted around. Mr. Brown took him to the ranch and offered him some work. It is supposed that when Heinson slipped and fell between the bales he was unable to extricate himself because of his physical weakness and suffocated in that position. The Coroner's Jury at Petaluma found a verdict of accidental death. "Dance," shouted Harry Maynard at Miss Marvel Watson as she stood on the porch of a house on First street last night. And because she was not quick enough to comply with his coarse demand, she says he whipped out a pistol and sent a bullet between her feet. The piece of lead did no damage and spent itself in the wooden step. Maynard might have run amuck further but for the timely arrival of Police Officer Lindley. Lindley heard Miss Watson's story and saw the place where the bullet had hit, took the revolver away from Maynard and marched him off to jail. Maynard was intoxicated, but made no resistance under the sturdy grip of the officer's muscle. At the police station Maynard was locked up for the night, and opposite his name on the docket are three charges, namely, "Drunkenness, discharging firearms within the city limits and carrying concealed weapons." It is believed that Maynard fired the shot at the young woman's feet to frighten her. She says that she has known Maynard for a long time, but hass had nothing to do with him lately. He arrived in town yesterday and went out calling on First street with his pistol in his pocket. He is quite well known here, in Petaluman and other places. The incident occasioned considerable excitement on First street last night, but this quieted down when Policeman Lindley came hurriedly on the scene in response to a call. Police Officer Boyes, whose territory takes in Barham avenue a few days ago heard a gasoline engine working busily away in the basement of R. Christ's residence. The officer at first thought it was a horseless wagon stabled for the night which had "got-a-going" somehow and the machine was enjoying itself during its hours of leisure. He investigate and what he saw sent him to hunt up Revenue Collector Walter Price. The government official took a look and stopped that gasoline engine forthwith. Then he put Uncle Sam's seals on the basement door and told Mr. Christ to keep out of the place. They had found a small private still complete for making prune brandy, and also that the owner was engaged in the work. He chatted volubly on the practical methods of distilling prune brandy, beer and other beverages, and exhibited his plant with considerable pride. His apparent innocency jarred the officers who are not accustomed to such unsophistication in this day and generation. The case hardened U. S. Treasury man sat down on a fruit box and thought of his childhood days while Boyes let his mind wander among the kindergartens he had visited. But when they told the distillery owner that he was an illcit moonshiner, a mountain-dew man the jar he got was great indeed. He insisted that he did not know that his occupation had heaved him hard up against the august Government of the United States and that his act smacked of "treason, strategy and of spoils." When he had recovered somewhat he protested that he had not know that such private distillations of spirituous liquors were interdicted. However, when the officers had enlightened him he grew indignant. "Cannot a man distill his own brandies, beers or other drinks?" he asked. He was told that this would not be permitted unless the distiller complied with certain laws enacted for the taxing and regulation of the manufacture. "Then I have a very pessimistic view of this country's laws," he replied. The officers found a 10-gallon key and several bottles of beer which he had brewed, also some prune brandy in different states of change from the honest, revenueless prune that needs no surveillance to the alcoholic fluid that must be gauged, bonded, fortified, rectified, stamped, taxed and retaxed every step of the way from the still of the maker to the mouth of the drinker. Christ is considerably of a domestic manufacturer. He makes and drinks tea made from raspberry and strawberry leaves, and coffee from barley. In these productions he shows an intelligence hardly in keeping with his pleas of ignorance of the revenue laws of this country. The seizure has been reported to headquarters and the matter will be investigated. It is the general belief among the neighbors of Mr. Christ that he was really ignorant of the fact that he was engaged in a lawless occupation and that his private plant was liable to seizure. He is an eccentric person, quite ingenious and original in thought, and was in all probability oblivious to the fact that he was stepping on the toes of Uncle Sam's treasury department. One cheer for the 1905 Press Democrat: Racism that year wasn't nearly as awful as in 1904. But a hiss for the Republican newspaper: What did you have against Japanese-Americans? News items demeaning Chinese, Black, and Native American local residents appeared repeatedly in the 1904 Press Democrat. Reports of simple events, even weddings, were sometimes expanded into racist vignettes by someone at the paper who mistakenly thought he possessed a talent for writing dialect humor. Race was also just below the surface in writings about the 1904 election, particularly as Finley expressed shock over an African-American child appearing onstage at the Republican Convention, warning it was a portent of dreaded racial integration. But aside from editorial outrage that President Teddy Roosevelt had appointed an African-American to a position of authority, the PD was mostly silent on matters of race in 1905. Compared here is Press Democrat and Republican coverage of the same event in the Chinese community. Press Democrat coverage is restrained, almost indifferent, except for the two regrettable uses of the old-timey "Celestial" stereotype. Aside for an inappropriate stab at humor ("post mortem spirito-creature"?) the Republican's offering was superior in every respect, and included details about participation of members of the white community that will likely be interesting to sociologists. The Shame Award for 1905, however, goes to the Santa Rosa Republican. Their description of a party of drunken Japanese workers was a throwback to the sort of crap the Press Democrat published the year before, filled with racial slurs, fanciful details that the writer could not possibly have known, and told in a manner inviting ridicule. Even with all its ethnic bashing in 1904, the Press Democrat held back from attacking Japanese-Americans. The Japanese community had deep social roots in the county, and it probably didn't hurt that Japanese-American businesses, such as the "Japanese Employment Office," were regular advertisers in the PD. Over at the Republican, racist slurs were never found under previous editor Allen B. Lemmon, and the new owners, transplants from the more cosmopolitan Oakland newspaper scene, appeared to share his progressive views. So why did the Republican trash its ethical standards to crudely insult the Japanese community? I'm puzzled, but can offer a few guesses. Although unlikely, it's worth considering that the story, factual or not, was published as some sort of a swipe at Ernest L. Finley and his Press Democrat. When this item appeared, the PD-Republican feud had escalated leagues beyond the "flapdoodle" between Finley and Lemmon the year earlier. Finley had started the fight with the new owners in March 1905, ridiculing them with a series of parody ads (blog post coming) that were probably side-splitting funny when read loudly in a saloon, but now just seem mean. The newsprint jousting turned serious in August, however, when the Republican charged the rival paper with tolerating criminal activities in town on behalf of its cronies (blog post coming about that, too). From then on, the editors took op/ed potshots at the other side nearly every day. The fumes were so toxic that anything that appeared anywhere in either paper at this time should be considered a possible veiled attack on their foe. Most of the tie-ins to their fusty newspaper war are no longer apparent today, of course. Honestly, interpreting these old papers is sometimes like being a Kremlinologist. Another possibility is that the Republican's shameful article was motivated by new anti-Japanese racism within the California GOP. Earlier that year, San Francisco labor unions had created the Japanese and Korean Exclusion League, seeking to expand the ban on Chinese "coolie" labor to include other Asian workers. Their champion in Congress was Rep. E. A. Hayes (R-San Jose), whose March 13, 1906 Japanese exclusion speech launched years of discrimination that would cumulate about twenty years later with a ban on virtually all Japanese immigration to America. Neither 1905 Santa Rosa paper mentioned the formation of the discriminatory League (which is odd, considering both took every opportunity to editorialize about other aspects of San Francisco politics), so it's unknown what, if any, influence the organization had on the editorial position of the Santa Rosa Republican. A third option is that the story was intended as a strained metaphor to lampoon the Russo-Japanese War, which had ended with Japanese victory just three weeks earlier. After being almost continuously on the front pages since the start of 1904, readers knew well the names of Yamamoto and Ito, both Japanese admirals. Also note the descriptions of the prizes: a statue of the "Emperor of Japan doing Hari-Kari to the Czar" and an oil painting of the Japanese flag flying on the courthouse in downtown Santa Rosa. Don't think so. But there's yet another explanation that's simplest of all, and thus the most likely: Was this noxious anti-Japanese story in the Republican authored by the same reporter who penned the racist stories in the Press Democrat a year earlier? Articles were never bylined in these papers, but the writing style here is quite similar to the hateful vignettes found in the 1904 PD, and this piece is likewise rich in fantastic details. That the reporter (let's call him "Racist Ralph") was hired away by the other paper would also explain the decrease of anti-Black, anti-Indian, and anti-Chinese reporting in the 1905 Press Democrat (again, the PD was hardly bias-free that year; it was just less contemptible). Even if the writing of the detestable stories of 1904 and 1905 all can be blamed on Racist Ralph, however, the disgrace of these articles appearing in the daily papers still falls to the editors. The aged Chinese woman, Kee Haw, who died on Second street last Wednesday, was buried yesterday by her countrymen in the county cemetery. She had lived in this city for some time and her death was from natural causes. The woman was very poor and a number of Chinese with some of the white neighbors provided the burial expenses and several of the white children in the vicinity of her late home placed a few flowers on the cheap coffin. Somewhat different was the Oriental contribution to the dead -- a bowl of rice and two chop sticks for her post mortem spirito-creature wants. On the way to the cemetery a Chinese rode on the hearse with the driver and scattered prayer papers along the way. These were propitiate the unseen attendant devils who play the star part in the Mongolian's religious belief. After a time, if the deceased has any friends either in this country or in China, her bones will be disinterred, sewed up in a little white sack and shipped home across the wide Pacific. If not, her dust will lie and mingle with those of the occident. Mrs. Kee Haw, a Chinese woman, who died on Second street on Wednesday, was buried Thursday morning in the county cemetery. A Celestial rode beside the driver on the hearse and let the customary shower of slips of paper fall en route to the cemetery. On top of the grave the roast pork and chicken was placed in due form and Celestials carried out the other fancies of their burial exercises. Mr. Oki Yamamoto, the proprietor of a Japanese boarding house in Cloverdale, gave a progressive euchre party at his spacious shack Sunday night. He invited all his countrymen from the surrounding vineyards and hop yards and the guests assembled early. Four large boxes helped out the three tables and by 8 o'clock the little brown players were pitching "jokers" and "bowers" at each other fast and furious. Refreshments were served bountifully in large glasses and this had a tendency to make the games over-interesting. Landlord Yamamoto noticed a spirit of battle breaking out in spots among his growing-noisy guests but with a section of hop-pole he knocked down several of the most truculent of his fellow patriots and kept white-winged peace present through roosting p [sic] on the roof to be out of the storm center below. Presently Mr. John Kinno, who had gone oftenest to the fountain -- said fountain being the host's demijohn of red, red wine -- broke out. He thought he saw Mr. Ito Hikikito lifting two jacks from a cold deck in his jumper pocket. With a frying pan which he grabbed from a near-by stove he soaked [sic] Hikikito over his dark brown head. Ito, bubbling with the war spirit of his great namesake, climbed from the floor where he had laid down and slept for a few moments just subsequent to his meeting with the frying pan, hurled several loud "banzais" and pulled his gun. Other guns appeared and white-wing peace turned in her hat check and left. One Jap got a chunk of lead driven into his muscular brown arm and another son of Nippon had one of his ribs scraped by a Smith & Wesson ball. The lights were shot out in true Caucasian style and the mirror in the proprietor's sleeping room was put out of commission. Several shot holes in clothing and walls were made. But the most desperate damage was done the three euchre prizes which were on exhibition in the room. One was a tiny statue group representing the Emperor of Japan doing Hari-Kari to the Czar -- a masterpiece of art, the second an oil painting of the Court House in Santa Rosa with the sunburst flag of the Jap flying over the building, a prophesy, and the third prize a small keg of rare old wine from the Fountaingrove winery. When the smoke had cleared away the first two prizes were found ruined, but the keg had disappeared. The gunners and their guns had disappeared when the Constable's posse broke in the door and only Mr. Yamamoto was present. He assured the "honorable" American gentleman that no trouble had occurred in his "dishonorable" habitation, in fact he had just awakened from a dream of peace in his "mean" sleeping place. No arrests. It's Hallowe'en, that magical night when precious little children dress-up and... say, why are those kids carrying toolboxes and ropes? As it turns out, trick or treaters today are pikers, compared to the hooligan that was your great-grandpa. 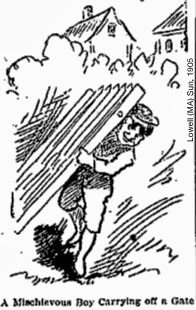 A favorite prank in 1905 Santa Rosa was removing the gate from a house and hoisting it into a tree, but according to papers in other cities, bicycles and wagon wheels were also common. In Winnipeg, overachievers not only unloaded a wagon filled with grain and disassembled the vehicle, but put the wagon back together on top of a barn -- and refilled it with the grain. Wisconsin paper urged readers to tie down their gates and bring in their cabbage. Um, hide the cabbage? An item in the Nov. 1, 1901 Racine Daily Journal explained the local custom: "Crowds of boys and girls will supply themselves with cabbage stalks and start down any of the residence streets, and then the fun commences. The homes most conspicuous prove to be the targets, after the leader gives the signal to throw every person in the crowd hurls a cabbage stalk at the door. If cabbage stalks are not to be obtained it is a very easy matter to find a substitute. Dirt, old shoes, stones, or 'any old thing' will answer the purpose..."
Some newspapers in the early Twentieth Century even printed Hallowe'en death tolls, usually of pranksters shot to death after being mistaken for prowlers. Six were killed in 1904, including a "man mistaken for Hallowe'en dummy run down and killed by street car at Columbus, Ohio," according to one casualty list. Almost a score of boys, some of them members of prominent families of this city, ended a Hallowe'en frolic by spending a few hours in jail at the city police station during Tuesday night. They were not content with the time honored frolic of removing gates but when they found one that did not come off its hinges readily it is charged that they just sawed it off and took a portion of the fence, too. They were very penitent when released from custody after confinement for a few hours and it is doubtful if they will ever do downright mischief on Hallow e'en [sic] and run too far away with the lenient view often taken that "boys will be boys." Chief of Police Severson has given orders for the police to strictly enforce the curfew ordinance. For some time the police have been a little lenient in this regard and boys have taken advantage of this and some damage to property has resulted. Now all minors who are caught out after the bell rings will be taken to the police station regardless of who they are or where they are going. Tuesday night about twenty offenders were locked up for several hours at the police station and before the matter is settled there will be a bill of damages to pay as the crowd destroyed a fence. Crime stories were the meat 'n' potatoes of old journalism, but newspapers in small quiet towns like Santa Rosa usually could only dish up leftovers reported on the wires from elsewhere. Thus it's no surprise that the 1905 Press Democrat gave lots of ink and a hefty two-column headline to this ripping yarn of a local crime. Well, attempted crime. As reported below, two strangers made a call on a Mrs. Dahlmier. While she was out of the room, the ladies snatched her jewelry (conveniently left in plain view). Discovering that her visitors were really thieves, the lady of the house brandished the family gun and demanded the crooks surrender the goods. A manhunt for the brigands followed, but was fruitless. The callers arrive and leave in a rubber-tired cart with a particularly docile horse. It's interesting that super-observant Mrs. Dahlmier noticed so many details about their ride, considering she was confronted on opening the door by two aggressive strangers speaking "in unison" while attempting to push their way inside. And about that getaway vehicle: The rubber tires are significant, given the poor state of both the 1905 roads and primitive tire technology; if the pair left town, they would have needed to stay on the main roads to Sebastopol, Healdsburg, or Sonoma, where police were undoubtedly on the lookout. Although the pair could have arrived in town on the train and rented the buggy locally, surely that stable owner would have provided more details about the mysterious women. "Mrs. Mitchell" and "Mrs. Oliver" said they were from Hazel street, two short blocks away. Would real bunco artists have risked claiming that they lived so closely nearby? The maps of the day show that part of Santa Rosa was sparsely populated, with only about 25 houses in that immediate neighborhood (and curiously, only a single house with an address on Hazel street proper). It was great good luck for the con-artists to have targeted a woman who knew so little about her neighbors. The Press Democrat described the Dahlmier home as a "cottage," and the insurance maps show it was about 900 square feet. Even if it was decorated "too cute for any use," as the visitors purred, it was still the modest home of a laborer and his wife, and thieves should have had low expectations of finding any valuable loot at all, much less a diamond ring lying in the open. The small scale of the place also meant that Mrs. Dahlmier was never more than a couple of steps away. Again, it was a lucky, lucky day for the robbers to find themselves alone in a room with expensive jewelry. There are other nagging questions about Mrs. Dahlmier's tale, including why she doffed her valuables in the first place. A piano player may take off loose-fitting bracelets or such, but rings don't interfere with tickling the ivories, unless the jewelry is the size of a knuckle-busting Superbowl souvenir. It was also curious that the telephone operator failed to answer at that critical moment; how long did Dahlmier try to connect? Surely "Central" was taking a bathroom break or was otherwise briefly indisposed, and it would have been better to keep trying the phone than to dress and hike seven blocks to the place where her husband worked. This is not the same cool player who had gotten the drop on grifters a few moments before. A few days later, a small item appeared in the Press Democrat reporting that there was nothing to report -- no trace of the criminal pair was found. But even lacking a conclusion, there was an adventure (real or imagined) on that late summer's day on the corner of Orange street and Sebastopol avenue. And the next day, Mrs. I-Have-No-First-Name Dahlmier got part of her name in the press, editor Finley filled a quarter-page of his newspaper with an original yarn, and readers were entertained with a tale of derring-do that sounded as if it was lifted from a dime novel, and probably was. After the experience she had on Thursday afternoon no one can charge Mrs. G. A. Dahlmier, wife of an electrician employed by the Santa Rosa Lighting Company, with being lacking in pluck and the possession of steady nerves when the demand is made. About two o'clock in the afternoon Mrs. Dahlmier went to the front door in response to a ring of the bell. On opening the door she was confronted by two stylishly dressed, comely women, who had driven up to the house in a rubber-tired cart. They introduced themselves with the utmost affability, inquiring the name of the lady of the house, and in the same breath telling her that they were neighbors of hers, and that their names were "Mrs. Mitchell" and "Mrs. Oliver," respectively. "You know," they said in unison, "we have been thinking of calling upon you for several days. We live on Hazel street, nearby, and as we are new arrivals here, we thought that we would get acquainted with our neighbors." Mrs. Dahlmier was pleased with the cordiality shown by her newly found neighbors, and hospitable woman that she is, she immediately invited her callers to come in. The invitation was accepted with apparent pleasure, and as the horse in the car was perfectly docile they did not tie him up. The callers were shown into the best parlor and "Mrs. Mitchell" and "Mrs. Oliver" were soon complimenting the pretty furnishings of the room and the general appearance of the house. They thought everything was "too cute for any use." Mrs. Dahlmier, who had been resting on the lounge before the ringing of the bell in another room, bethought herself that she should spruce up a bit, and excused herself for a few moments. Earlier in the day she had been playing the piano and had removed two valuable rings, one set in diamonds and the other an opal, and had laid them on a lace handkerchief on top of the instrument. Before she retired to adjust her toilet she noticed that the rings and handkerchief were still where she had placed them. While in another room she heard one of the women walk over to the piano and run her hand idly up and down the keys. At the time she thought that evidently her guests were of the Bohemian cult and believed in making themselves perfectly at home even on the shortest of acquaintance. When she re-entered the parlor a glance at the piano showed her that rings and handkerchief were missing. Then the truth flashed upon her. Possibly she was entertaining not angels, but thieves, unawares. "Why," said she, with apparent concern, "I thought that I had left my rings and handkerchief on the piano. I must have been mistaken. Oh, yes, I know, I left them on a shelf in the china closet. Pray excuse me ladies just a moment." Mrs. Dahlmier says that her mission to the china closet was not with the idea of looking for her jewelry. It was to get the big pistol. It was unloaded 'tis true, but she thought that it would accomplish what she desired. It will be seen that it did. "One of you women has taken my rings and handkerchief, and you have got to give them up before you leave here." At the same moment she leveled the dangerous looking revolver at her guests. "Mrs. Mitchell" and "Mrs. Oliver" at once rose to the occasion and essayed to back away from the range of this pistol. "Don't move a step. If you do, I will kill you. I mean it," said the plucky little woman. "You just give me back my rings and handkerchief." At this she toyed with the trigger as if she meant business. Without further parleying one of the women, cute "Mrs. Oliver" slipped her hand into her shirtwaist and produced the rings and handkerchief. Mrs. Dahlmier grabbed her property and the women dashed out of the house and jumped nimbly into the cart and drove away. For some moments Mrs. Dahlmier says that she was so scared she did not know what to do. When she recovered her composure she ran to the telephone to call the police, but for some reason could not get an answer from "central" at the time. She dressed herself and came up town to tell her husband and her mother. When the officers were informed no trace of the well-dressed strangers could be found. All night a close watch was kept for women answering the description of Mrs. Dahlmier's callers. She says the women were elegantly dressed. One wore a blue silk dress and the other a plaid silk. Both wore big, black hats and veils. Whether these woman thieves made other calls Thursday afternoon was not ascertained. During their conversation with Mrs. Dahlmier they asked her the names of other "neighbors" and evinced a desire to avail themselves of the pleasure of making themselves known to them also. The plan of campaign they adopt in the role of the light-fingered is certainly a neat one. But they had better cut their calling list short in the City of Roses now. They won't be admitted into other houses on any such pretenses as the one that gained for them a short welcome at the corner of Orange street and Sebastopol avenue. Future callers, in the guise of "neighbors" will be more closely scrutinized by Mrs. Dahlmier than were Madames Mitchell and Oliver on Thursday afternoon. All but forgotten today, the first "portable" phones were used by train crews to talk to the nearest station in case of breakdown or emergency. 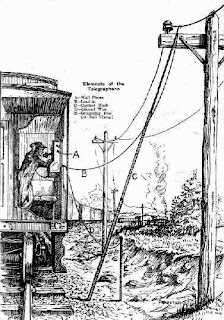 William B. Glardon apparently invented, but did not patent, the idea that you could lean a pole against the telegraph lines to make a quick call from a stopped train. By WWI, the "telegraphone" -- not to be confused with the earlier magnetic wire recorder, also called a telegraphone -- was in wide use. Telephones were also permanently mounted on some telegraph poles (and probably carried the first prank phone calls). The "Telegraph Lore" web site has more pictures and details on this simple but effective technology. The Southern Pacific Railroad installed an emergency telephone in the Santa Rosa depot yesterday. This is a new feature to western railroading, but has come to be a regular feature of most of the eastern lines. The first trial of the system on the roads in this state was made in Southern California within the last three months and has proved a great success. The idea is to use the telegraph wires of the road for telephoning in case of emergencies. The telephone compay uses its wires for telegraphing in addition to telephoning, and there is no interference in the use of the line for either purpose. The only other phone put in on this branch is at Napa Junction, which can be reached by the Calistoga branch and mainline at Suisun. The passenger and freight trains are provided with portable telephones having extension rods. 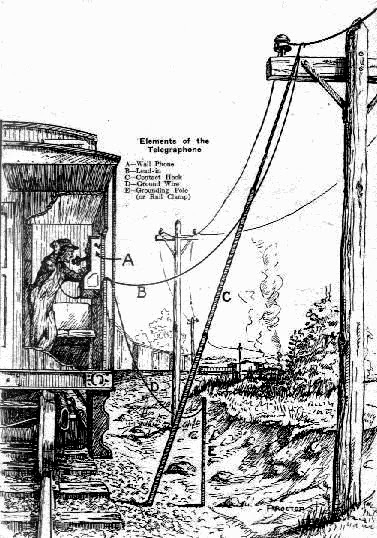 In case of unexpected delay, break down, or wreck on the road anywhere the conductor takes his phone, goes out and with the aid of the extension rod attaches his wire to the nearest telegraph wire. He is then able to ring up the nearest emergency office and tell them what has occurred and in turn may receive instructions as to what course to pursue. The new system provides for instant communication from a disabeled train to the dispatcher's office, and in case of need will often reduce the time of securing assistance by several hours. Under the old regime a man had to be sent afoot to the nearest telegraph office which in many case would be miles away.